I am a director of UKOUG and when I first joined the board I took a real interest in how the board actually worked. In UKOUG we do not outsource our services they are provided by our own staff, in our own building. This autonomy is much desired and envied by other groups but has its own challenges. As a director I am responsible for the future success of the company and the legal requirements such as trading, accounts, staff health and safety. I took a diploma with the Institute of Directors and was very proud when after much late night studying and writing my professional evidence portfolio and facing a panel of peers I was awarded Chartered Director in 2006. One of the subjects I enjoyed most was marketing and especially the subtle marketing such as viral marketing. I have written before about how the ACE Program taps into the powerful messaging someone outside Oracle has. The fact that I talk about Oracle with passion and yet an equal amount of cynicism is recognised by Oracle as being very effective (even if they don’t say so out loud). The ACE Program is an example to all organisations. One place I could never work is Oracle itself, and they probably would not want me anyway. So this week I found myself at my local IOD annual dinner. The chairman of the IOD in Northern Ireland is Joanne Stuart who coincidentally used to work for Oracle and I have known her for many years. This year as an after dinner speaker Joanne had invited BJ Cunningham. I didn’t know how global a brand he is and to be honest I had never heard of him before. I can’t say I hadn’t seen him before as we checked into the hotel at the same time and he was quite a character, wearing his tuxedo under an olive long length parker, I was tempted to ask if he had left his moped outside. BJ is an entrepreneur who pushes everything to the limit. He believes in doing the unexpected and has not always been successful but he loves what he does and has a fantastic story to tell. His main claim to fame was the ‘Death Cigarette’ now I am not condoning smoking but you have to admire his thinking. He says look at the problem to find the answer. Everyone knows that smoking is not good for you, yet tobacco companies try everything to make you buy their products, governments do the ‘right thing’ but banning advertising and printing health warnings but they don’t want tobacco to go away they make an awful lot of money from the taxes. 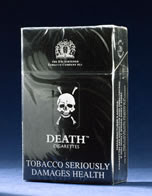 So BJ created the ‘Death Cigarette’ put a skull and crossbones logo on them and in a two fingered salute to the tax man found a legal loophole. He had seen people evade prosecution for non payment of VAT on cigarettes and alcohol brought from Europe by declaring them for personal use. He also knew that the legal definition of an agent acting on someone’s behalf meant that they were an extension of the person they acted for. So he set himself up as a cigarette agent! Eventually the tax man caught up with him and he ended up in court where the judge said and I can’t do the wonderful French accent BJ used but imagine it “In law you are correct, but the law was never meant to allow you to do this, so you are wrong and therefore guilty”, hard to argue with. This is very funny but the point the was trying to make is around the brand and loving what you do. He said a brand is a promise and not a logo. I totally agree and have written about the Saatchi and Saatchi Lovemarks concept, which I talked to BJ about later, he was impressed I knew about it. Regardless of the product his business case stacked up and he was able to borrow money. In his talk he also had a humorous look at business cases and their later success. I have to say at this point I wondered exactly what he was smoking as to an audience of 400 people in Belfast, In the Europa which has the dubious honour of being the most bombed hotel in Europe, he decided to use religion as his case study. The business case of a virgin birth and the ultimate sacrifice may not sound a good investment but whatever you believe it is successful, with a great logo and phenomenal following. You could have heard a pin drop until he finished, I think he may have been the only person to survive religious humour in the history of N Ireland. But he was not making a joke at anyone's expense, he wanted people to think about the concept of the brand. It was a fantastic and thought provoking look at business, and later I spoke with BJ and I asked him about how he markets himself. He doesn’t yet really but is thinking about it and I know he will be successful. I suggested he do more short videos and put them on youtube. His story is funny and yet has a great message. Video is the new pod cast, blog etc, you only have to look at the Miracle Channel to see how powerful it can be. In a way I am in marketing, I am selling the brand of UKOUG here in this blog, the promise that ‘We serve the Oracle Community’ and less obviously the brand of my day job where the attributes I display are in tune with their philosophy. And yes I love what I do. BJ I apologise for any inaccuracies in my memory.